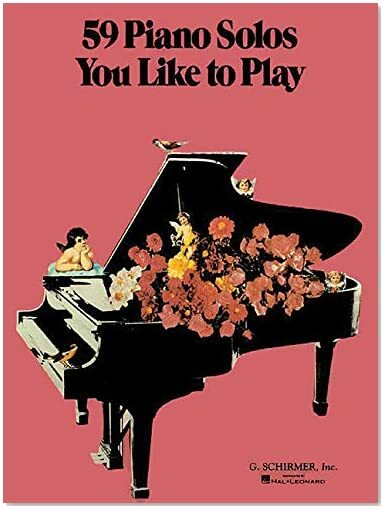 59 piano solos you like to play by Schirmer, G.
Statement of responsibility: G. Schirmer, Inc., Hal Leonard Corporation. Other physical details: UPC 073999272505. Dimensions: 11.9 x 8.8 x 0.6 inches, 1.6 pounds. Summary or note: Sheet music for 59 piano solos: Albeniz: Tango in D * C.P.E. Bach: Solfeggietto * J.S. Bach: Prelude in C (Well-Tempered Clavier, Book 1), Prelude in Bb minor (Well-Tempered Clavier, Book 2) * Beethoven: Variations on "Nel cor piu non mi sento," Minuet in G * Brahms: Hungarian Dance, No. 5, Waltz in Ab * Chaminade: Scarf Dance * Chopin: Prelude in A, Op. 28, No. 7; Prelude in C Minor, Op. 28, No. 20; Waltz ("Minute") in Db, Op. 64, No. 1; Mazurka in Bb, Op. 7, No. 1; Polonaise ("Military") in A, Op. 40, No. 1 * Cui: Orientale * Dvorak: Humoreske * Elgar: Love's Greeting (Salut d'amour) * Fibich: Poem * Friml: Chanson * Granados: Spanish Dance (Playera) * Grieg: Album-Leaf, Anitra's Dance, To Spring, March of the Dwarfs * Handel: Largo * Lasson: Crescendo * Liszt: Consolation No. 5 in E, Liebestraum No. 3 in Ab * Mascagni: Intermezzo from "Cavalleria Rusticana" * Massenet: Melodie * Mendelssohn: Spring Song, Venetian Boat-Song No. 1 in G Minor, Consolation * Moszkowski: Serenata * Mozart: Rondo (alla turca) * Offenbach: Barcarolle from "Les Contest d'Hoffman" * Palmgren: May Night * Rachmaninoff: Prelude in C# Minor, Prelude in G Minor * Rimsky-Korsakov: Song of India from "Sadko" * Rubinstein: Kamennoi Ostrow, Melodie (in F) * Saint-Saens: The Swan * Scharwenka: Polish Dance in Eb minor * Schubert: Military March in D, Op. 51, No. 1; Moment Musical No. 3 in F minor * Schumann: Romance in F#, Op. 28, No. 2; Traumerei * Sibelius: Romance * Sinding: Rustles of Spring * Strauss: On the Beautiful Blue Danube * Tchaikovsky: None but the lonely heart (Nur wer die Sehnsucht kennt), Andante Cantabile from Quartet, Op. 11; Song without words * Thome: Under the Leaves * Valverde: Y...como le va? * Verdi: March from "Aida" * Wagner: Bridal Song from Lohengrin-Tannhauser March.